Join the R.O.A.D.S. study! 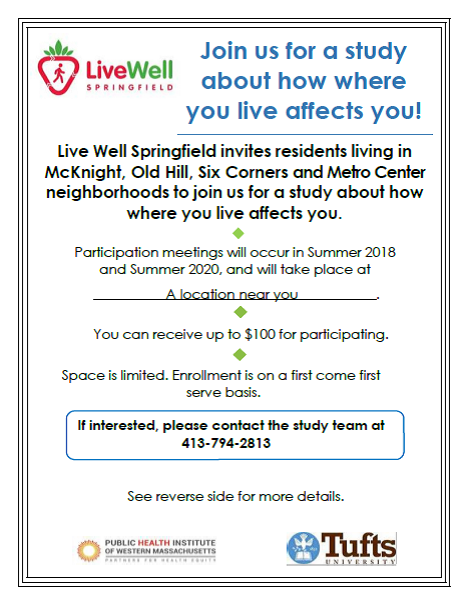 The Public Health Institute of Western Massachusetts and Tufts University in partnership with LiveWell Springfield invites Springfield residents living in select neighborhoods to join us for a study about how where you live affects you. Learn more here. PHIWM has received one of only nine national Robert Wood Johnson Foundation Policies for Action Grant to study Springfield's Complete Streets policy. "Complete Streets" refer to policies that support roadways that are designed and operated for the safety of everyone using it—whether by car or bike, foot or bus. PHIWM and Tufts University, led by principal investigators Kathleen Szegda, PhD, MPH, MS, and Erin Hennessy, PhD, MPH, will investigate whether “Complete Streets” policies lead to changes in the built environment, the economic environment, the social environment, and health/health behaviors. This research is a quasi-experimental, mixed-methods participatory research project using an equity lens. It will holistically examine effects of adoption and implementation of a CS policy on a mid-sized city experiencing numerous health inequities, including how the policy was implemented and the subsequent effects on the built environment, economic outcomes, social environment, health behaviors and health. We are partnering with LiveWellSpringfield's Transforming Community Initiative as partners on this project and we will engage community residents in data collection (e.g. bike/pedestrian counts) and interpretation efforts.